3 Single Sided Flat Shelves: with 12.6" clearance between each shelf. Single sided design makes transiting stable. Flat shelves you can put various stuff on it. Sturdy Steel Made: 18 gauge welded steel frame and 20 gauge steel shelves, durable enough to support books up to 200 lbs. Glossy Surface: powder coat finish shows a smooth surface and resists chipping and corrosion. The U-shaped handles are smooth rounded for a comfort grip. Casters with Locks: push,pull or swivel the cart easily with the sensitive casters. Wheel locks can prevent slide when stop the cart. 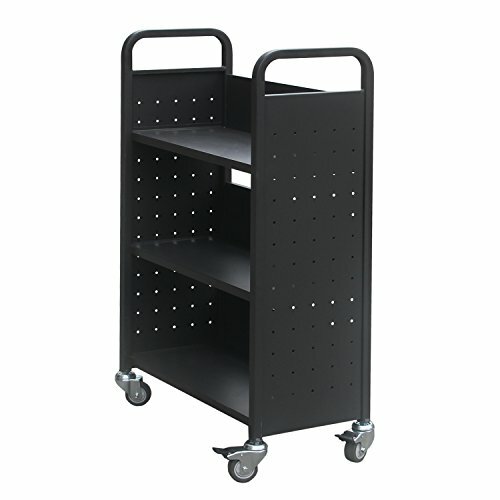 Extensive Use: utility steel truck offer maximum strength and efficiency to transit books or big stuff.Perfect for bookstores,libraries,schools or offices,as well as home and restaurant for space-saver or transport. If you have any questions about this product by Hans & Alice, contact us by completing and submitting the form below. If you are looking for a specif part number, please include it with your message.